George Graham Reviews John Gorka's "After Yesterday"
Singer songwriters are a dime a dozen anymore, or so it seems, with the proliferation of album releases in the genre. Very good singer-songwriters also number in the hundreds, with lots of notable recordings coming out each year, even though interest in thoughtful, articulate music among the major record companies is at a low ebb. But for my money, one of the very finest of the current generation of singer-songwriters is John Gorka, who had just released his seventh album entitled After Yesterday. A native of New Jersey, John Gorka got his start here in Eastern Pennsylvania at the Godfrey Daniels Coffeehouse in Bethlehem, where he first worked as a volunteer and before deciding to try some of his songs in front of the rather discriminating audience there. His career has been on an upward climb ever since. He began to attract national attention though folk festivals and songwriting competitions, and in 1986 released his debut album entitled I Know. He developed a glowing reputation, especially among critics and musical peers for his combination of a warm performing style, personable baritone voice and lyrical wordcraft that other songwriters would kill for: songs almost always delivering great turns of phrase, sometimes with a low-keyed sense of humor, and often addressing unexpected subjects. After his debut, Gorka was signed to Windham Hill Records and its High Street subsidiary. He thus enjoyed major label distribution, starting at a time when there was increased interest in the genre, following the success of Tracy Chapman and Suzanne Vega in the mid to late 1980s. But with understated, literate music like Gorka's now being assiduously shunned by the commercial media in favor of the likes of Hanson and the Spice Girls, and given the economics of consolidation among the major labels, Gorka is back on the St. Paul, Minnesota, based independent label Red House on which he released his first album. Despite the change in distribution, Gorka's new release is a continuation of the music that has made him such a critics' favorite and has won him so many fans over the years. Once again, he creates songs that are both pleasing to listen to, and are lyrical masterpieces. Gorka's songwriting seems to move in phases, with some albums being dominated by certain feelings or emotions. His last album, Between Five and Seven -- released two years ago and to me his finest work so far -- revolved around a loose series of characters, mostly misfits of one sort or another. After Yesterday is more personally reflective, and three songs came out of his becoming a father for the first time. As usual, there's a touch of humor here and there, along with a sense of poignancy elsewhere. He sings of getting through life's rough spots, and considers what happens when somebody loses his job. He also does a whimsical but pointed twist on theology. Now based in Minnesota, Gorka works with many of the same musicians who appeared on his last album, including John Jennings, the multi-instrumentalist from Mary Chapin Carpenter's band, who also co-produced the album with Gorka. Also appearing are Michael Manring, the bassist and fellow former Windham Hill artist, guitarist Dean McGraw, also from Mary Chapin Carpenter's band, mandolinist and fiddle player Peter Ostroushko and Andy Bochansky, known for his work with Ani DiFranco. Making a prominent return appearance on backing vocals is Lucy Kaplansky, who is a fine singer-songriter in her own right. The new album has a somewhat looser, more acoustic and folky sound than Between Five and Seven, but it fits the music well. John Gorka's new seventh album After Yesterday is another fine record from one of today's very best singer-songwriters. Gorka does what every artist in the genre strives to do, create memorable songs with superb wordcraft, and perform them a wonderfully appealing manner. Gorka's warm baritone voice and his relaxed style helps to make his songs all the more outstanding. Perhaps because of his move back to an independent record label, this album has a distinctly more informal, laid-back sound that his last major-label record which itself made no compromises toward commercialism. All the musicians sound as if they are having a good time, and the playing is quite tasteful. The album's production and sound are in keeping with the its more laid-back feel. There are some little glitches and evidence of humanity that are left in, things that on a bigger production might end up on the cutting room floor in the quest for technical perfection. Sonically, the album is very pleasing: the recordng has great clarity, plus the lack of studio effects, including much of any reverberation, and a decent dynamic range gives the effect of bringing John Gorka's living room into yours. 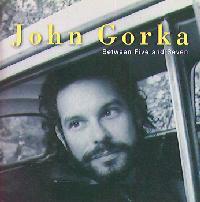 John Gorka will have a hard time topping his last album Between Five and Seven. But his new release After Yesterday is on the par with its predecessor and a reminder of just how good the singer-songwriter genre can rise in the hands of one its finest practitioners. (c) Copyright 1998 George D. Graham. All rights reseved.